Pension ‘cram down’ in Stockton bankruptcy? 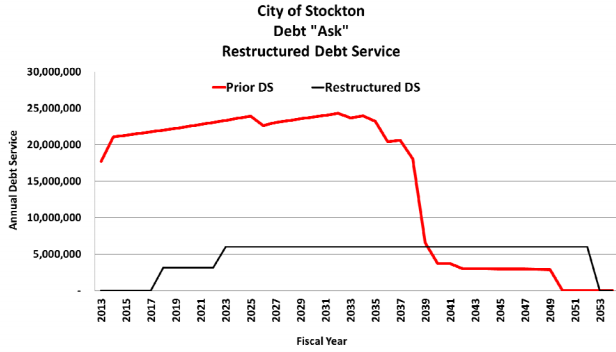 A federal judge suggested last week that pension cuts in the Stockton bankruptcy may not be a key issue until the city tries to negotiate a debt-cutting “plan of adjustment” with creditors, a step awaiting an eligibility ruling after a trial later this month. Bond insurers say a city proposal to reduce its long-term debt, including a $124 million pension bond, treats them unfairly because the biggest creditor, CalPERS, is left untouched. “I understand the financial market creditors are upset about that and contend that if they have to take a ‘haircut,’ so do you,” U.S. Bankruptcy Judge Christopher Klein told a CalPERS lawyer, Michael Gearin, at a hearing last week. Gearin asked for time to clear up misunderstandings about CalPERS during the eligibility trial scheduled to begin March 25. The judge said battles between creditors usually happen after an eligibility ruling during negotiations on a plan to cut debt. “Ultimately, if someone is objecting and not accepting their treatment in the plan, you get to the famous ‘cram down,’ said Klein, where the goal is not to “discriminate unfairly” while imposing debt cuts opposed by creditors. A “cram down,” a term used in private-sector bankruptcies, might be a first for municipalities if used in the Stockton bankruptcy. Vallejo considered a pension cut in its bankruptcy, but chose another path after CalPERS threatened an all-out legal battle. A problem for the bond insurers is that Stockton does not want to cut pensions. If the judge rules that Stockton is eligible for bankruptcy, the city might ask for a cram down that spares CalPERS if no agreement on a plan is reached in negotiations. Klein has said that the court cannot impose a plan of adjustment. But the court can reject a plan for being unfair to creditors. Vallejo creditors reached a consensus, but only after more than three years of costly legal battles. Stockton argues that eliminating retiree health care and employee pay cuts of up to 30 percent are a fair share of the ‘hair cut’ for members of the California Public Employees Retirement System. In a city with a high murder rate that has cut 25 percent of its sworn officers, Stockton argues, a pension cut would make it more difficult to retain and attract experienced officers and recruit qualified new ones, further weakening public safety. Stockton filed for bankruptcy last June, temporarily staying debt collection. Before filing the city went through a 90-day mediation with creditors as required under a new state law, AB 506. No agreement was reached with key creditors, but the city did produce a 790-page restructuring plan. Called the “Ask,” the plan gets much of the savings needed to close a $26 million general fund gap by cutting retiree health care and bond payments. Vallejo got most of its bankruptcy savings from the same two targets, retiree health care and bond debt. Perhaps fearing a trend, the bond industry formed a well-financed coalition and hired major law firms to oppose the Stockton bankruptcy. Capital Markets Creditors is led by Assured Guaranty, the insurer of the Stockton pension bond and two other issues totaling $161 million. Other members are National Public Finance Guarantee, Franklin and Wells Fargo. Eligibility may be the coalition’s best chance to avoid cuts. A National Public filing cited rulings saying eligibility should be regarded with a “jaded eye,” because the court has only limited control of the debtor after bankruptcy is approved. Stockton made a motion last week for eligibility without a trial, arguing that the opposition missed a filing deadline and did not dispute the main insolvency facts. Klein said the motion was “well taken,” but a trial is needed because of a likely appeal. Without a trial record, said the judge, an appeals court might start the process anew, taking more time and expense. He wants to limit the trial to four days, giving each side equal time. Because municipal bankruptcies have been rare, the Stockton case is part of a small wave setting new legal precedents. A Klein ruling denied a request to block a Stockton plan to end retiree health care and save the general fund $9 million a year. Klein’s actions have been mentioned by the judge in the San Bernardino bankruptcy, Meredith Jury. Rulings by Judge Michael McManus in the Vallejo bankruptcy are cited in several filings. The largest municipal filing, Jefferson County Alabama in November 2011, is simply referred to as “Jeffco” in some filings. Judge Thomas Bennett was said to be on the cutting edge of bankruptcy law in a Wall Street Journal profile last November. Much of Stockton’s financial problem is blamed on a housing boom and bust. But in arguing that the city budgeted itself into insolvency, Assured Guaranty said Stockton officials acknowledged excessive wages and benefits, some inflated about 25 percent. A Stockton Record newspaper investigation last week revealed that of the city’s 1,279 full-time workers last year, 23 percent made $100,000 or more, down from about 30 percent two years earlier. A police chief retired in 2011 with earnings for the year of $413,836, inflated by cashing in unused vacation and sick leave. A community development director retired and then came back on special assignment, earning $436,086 for the year. If Stockton is ruled eligible, another problem for the bond insurers is that they have been vague about how the CalPERS debt would be cut. Stockton argues that neither the city nor CalPERS “has the power to loot the funds” held on behalf of retirees. “So while CalPERS serves as a convenient strawman for the Objectors, their real argument is that the City’s past and current cuts to employees and retirees ‘do not go nearly far enough,’” lawyers for the city said in a filing last month. CalPERS rejected a belated Stockton request for a “hardship” rate reduction estimated to save the city $4.5 million over three years. If Stockton terminates its CalPERS contract, the city would immediately owe CalPERS $1 billion or more. During a CalPERS board discussion of terminated plans last November (possibly sparked by San Bernardino, which stopped making annual payments to CalPERS), the board was told pensions can be cut if a terminated plan’s assets do not cover obligations. “The law prescribes should that be the case the members’ benefits will be reduced until such a point basically as it (the terminated plan) is full funded,” said the CalPERS chief actuary, Alan Milligan. Last week, Judge Klein again urged the city and the bond insurers to negotiate an agreement. He said a mediator brought in last August, Judge Elizabeth Perris, remains available. Stockton announced an agreement last week with a bond insurer, Ambac Assurance, that never joined the coalition. The agreement on $21.6 million in housing debt is said to save the general fund money and provide “fair repayment” over time. “This agreement is an example of what can be accomplished during the city’s bankruptcy with creditors who are willing to engage in meaningful negotiation,” the Stockton city manager, Bob Dies, said in a news release. This entry was posted on March 4, 2013 at 8:28 am and is filed under Bankruptcy, Stockton. You can follow any responses to this entry through the RSS 2.0 feed. You can skip to the end and leave a response. Pinging is currently not allowed. What a ridiculous statement. The fight isn’t over past money paid into CalPERS or the “looting” of any assets now held by CalPERS for Stockton’s pension Plans. The fight is about the inability to pay off (a) current unfunded liabilities and (2) FUTURE contributions. Such ridiculous statement show how disingenuous the City is acting in addressing these issues. The judge should ………. AT THE LEAST …. have the power to end the DB Plans for FUTURE service, as they are clearly BOTH unaffordable and excessive. I wonder if the rating agencies will start assigning junk bond ratings to all cities and counties that have unfunded pension liabilities, which in California is going to be approximately all of them? DB plans are the most affordable and form of post-retirment income. They were abused in California and made excessive, but many public entities in the US have used DB plans economically. As for Stockton, I’d suggest any entity (person or corporation) with gross income of >$200,000 lose the payments owed to them. Between $100,000 and $200,000, you get 50% of what is owed. <$100,000, you get 100%. My mother and sister are named on the mortgage. was caring for our very own indisposed mother..